Nigeria International and Shanghai Shenhua of China striker, Odion Igahlo has been named the Chinese Super League Player of The Week. 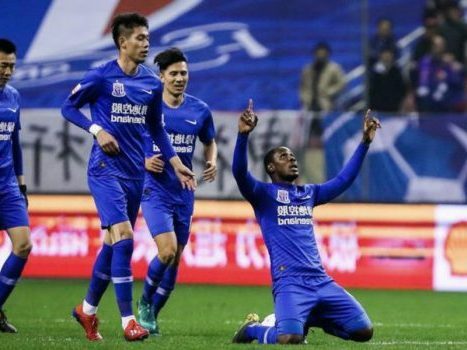 The 29-year-old Ighalo completed four take-ons, a joint game-high with compatriot, Sone Aluko and Fredy Guarín when his team routed Beijing Renhe 5-1 at the Hongkou Stadium in Shanghai on Sunday. Partnered in attack by Giovanni Moreno in a 4-4-2 formation, the former Watford of England star also netted his first ever brace for Shanghai Shenhua since joining the club. With a rating of 9.84, the Africa Cup of Nations qualifiers top scorer was the best rated player in the Team of the Week and as a result was named the Chinese Super League Player of the Week. Ighalo had a game-high six shots against Beijing Renhe, three of which were on target. He made two key passes and had a passing accuracy of 77.8 percent.